Prompting is Open at HP Goldenage! hp_goldenage is such a fun fest, and prompting is currently open for the 2018 run. It's a multi-pairing fest, and as long as all parties in the pairing are over 50 years old, anything goes! 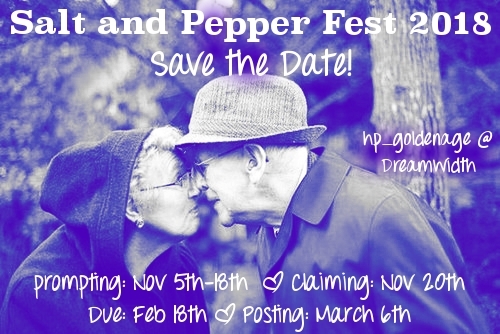 There are always a lot of really amazing and interesting fics that come out of this fest, and I have a blast coming up with prompts, since in some ways, playing with older characters allows you to explore different themes and issues. Anyway, you all should totally head on over to the comm and leave all of your wonderful and creative prompts so there are plenty of options to choose from come claiming!